Hope everyone had a wonderful Thanksgiving Day yesterday! I spent the last couple of days at one of my favorite locations in Missouri to photograph nature … the Loess Bluffs NWR (formerly called Squaw Creek NWR) … most of the time I still refer to this wonderful location as Squaw Creek. Do you recognize these beautiful birds? 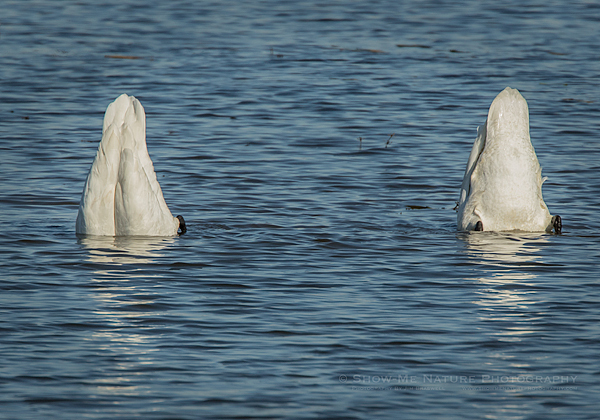 This is a pair of Trumpeter Swans, feeding from the bottom of one of the refuge pools. There were well over 100 migrating Bald Eagles, over 300,000 Snow Geese, over 100 Trumpeter Swans, and countless numbers of ducks and Canada Geese at the time of my visit. So expect to see more wonderful bird photos over the next few days! Tags: 2018, behavior, bird photography, birding, birds, birdwatching, Blog, fall, Loess Bluffs NWR, Missouri, nature, nature photography, photography, Squaw Creek NWR, travel, Trumpeter Swans.